Flemish, “Cortege of the Giraffes,” from The Voyage to Calicut. Early 16th century, tapestry. Woven into the threads of a Renaissance tapestry, early Portuguese explorers’ exotic journey across the Indian Ocean depicted a world yet undiscovered. Though of little significance to the fate of countless slaves shipped from the coastal ports of East Africa, this fictional diaspora illustrates, however fancifully, the interdependent web of commerce and culture that linked Africa and India when Europeans arrived in that part of the world. As explorers sponsored by Prince Henry the Navigator rounded the curving mass of West Africa, the exploitation of the continent centered on the availability of gold, ivory and slaves. Successive voyagers continued further down the western coast to discover the southern end at the Cape of Good Hope. From there, the long-hoped-for direct sea route to the great spice markets of the Indian Ocean lay directly ahead. Portuguese mariner Vasco da Gama was among the first to venture along the eastern shore of Africa. In 1497 his large fleet departed the port of Lisbon, Portugal, in search of Calicut, the distant trading center. He intended to travel the Indian Ocean to the fabled “City of Spices,” long known as an abundant source of black pepper and cinnamon, among others. Da Gama finally reached his goal in May 1498, initiating a centurylong Portuguese monopoly of the Eastern spice trade. Upon his return to Lisbon, da Gama became one of the most celebrated men in Europe. The most lavish record of his journey, commissioned by the Portuguese court, was woven into several enormous tapestries made of silk and wool. Generally known as The Voyage to Calicut, the series of wall hangings recounted the voyage in aggrandized form, including this intriguing, idealized procession of exotic animals and people. However fabulous the grand cortege may seem, it also presents an ideal view of the lands bordering the Indian Ocean. Among the variety of ethnicities presented, black people play a distinct role. 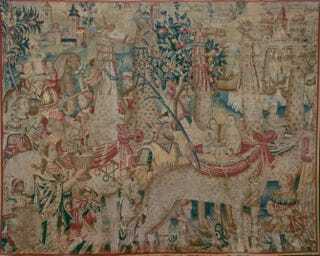 Over a period of at least 20 years, all the great rulers of Europe purchased complete sets of the tapestries. Judging from contemporary documents, the series consisted of five or six pieces, each about 14 feet high and 20 feet long. Altogether, the impressive ensemble would have covered 100 feet of wall space. Though no set remains, the general contents of the series can be reconstructed from surviving examples. When intact, the ensemble gave its viewer the equivalent of an eyewitness perspective of da Gama’s triumphant arrival in India. The initial scene depicted the departure of da Gama from Lisbon as the court of Portugal’s King Manuel I bid him farewell in a solemn ceremony. The subsequent tapestries record various stops at ports along the east coast of Africa, including a visit to the Arabic ruler of Malindi, a kingdom now in Kenya. Upon his arrival in Calicut, da Gama is received by its zamorin, or ruler. A magnificent cortege of giraffes celebrates this splendid occasion. In the final tapestry, the great explorer returns home and is warmly received for his discovery of the sea route to India. Five giraffes from the African savannah parade from left to right across the full width of the tapestry. Even though adult giraffes reach an average height of 12 feet or more, the dimensions of the piece easily accommodate their full-scale representation. Small children ride on the backs of the giraffes, seated in elaborate hammocklike cloths tied to the giraffes’ necks. They are tended by three men of much greater stature than the other figures in the scene. Both have black features and may be intended to represent a mythical race of African people. Men and women of various ethnicities, wearing exotic costumes, walk amid the animals. At the left, a man wearing a short fur cape sounds a long trumpet. His facial features and tightly coiled beard are clearly of African origin. Below him, two black drummers beat the rhythm for the procession. They are dressed in ornate costumes and play two types of drums. Both wear gold earrings. The youth on the left wears a headband of striped cloth knotted in the back and adorned with a large feather above the forehead. The conventional heraldic device is fleshed out into a fully animated figure. The two black youths seen here drumming the beat for the cortege’s progress increasingly appeared in the noble courts of Europe as exotic pageant figures. To fully appreciate the tapestry’s original narrative scope, one must take into account the considerable damage it has suffered over time. Fortunately, several other examples of the scene have survived. In one, da Gama stands at one side amid a tight cluster of dignitaries. Chief among them, demonstrated by his fine dress and large stature, is the zamorin. Facing the assembled court leaders, da Gama turns his head back to observe the parade as it approaches Calicut. The zamorin’s obliging gesture portends a long and prosperous future for the Portuguese commercial venture in the spice trade. The cortege of the giraffes, it turns out, was real enough, but only as a stunning set piece in the intricate arsenal of Portuguese state propaganda. What is being celebrated in the tapestry is not an actual event but a complex allegory of the Portuguese mission to India. A full range of skin colors and facial types represents the inhabitants of the many lands around the shores of the Indian Ocean. In similar fashion, the large tree in the center bears multiple kinds of exotic fruit, including pomegranates and peaches. The tapestry gives an altogether different impression of sub-Saharan Africans from that encountered in European art of the period. Unlike the situation along the west coast of Africa, the slave trade beyond the Cape of Good Hope held far less interest for the Portuguese. Of primary concern was direct access to the spice markets lying along the western coast of India. For the first time, an emissary of European commercial interests gained firsthand knowledge of his Eastern counterparts in culture, trade and religion. Despite his own nation’s founding of the West African slave trade, da Gama seems not to have viewed black people as potential items of trade. The role played by Africa in the realization of Portugal’s trading mission to India proved to be absolutely vital. Ports along the East African coast, such as Malindi, provided essential supplies for the final leg of the voyage to India, more than 2,000 miles to the northeast. The tapestry series of da Gama’s Voyage to Calicut, including the great triumphal procession, bears witness to the role of Africa in the success of the explorer’s mission as much as it highlights the climactic moment of his fateful meeting with the ruler of Calicut.